I was planing on showing you my favoutite part of our new apartment today but decided this post was so much more important. Today I picked up the most awsome pacage from the post office. 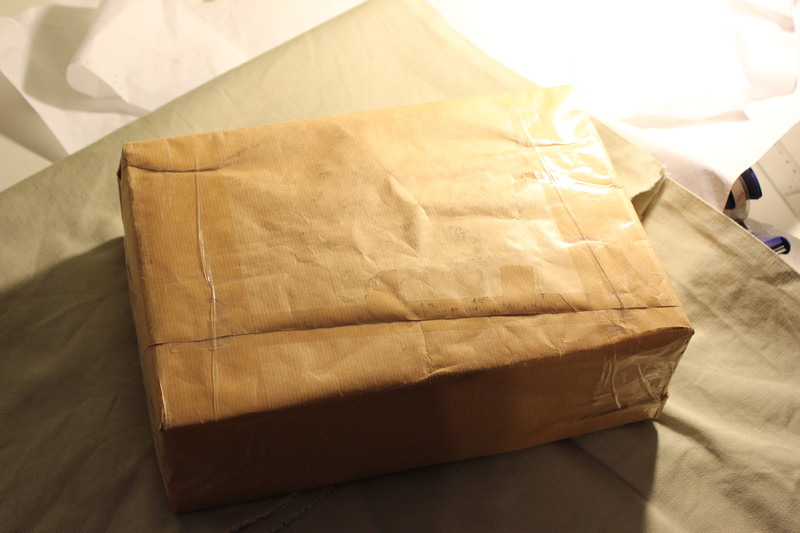 – A box that I recently won biding on an on-line auction. And since I’m really terrible at that kind of biding I don’t do as much good deals as I would like. But I had a good feeling on this one. So I hurried home (determend to not get to disaponted if the containt didn’t live up to the expectations) and put it on my sewing table. 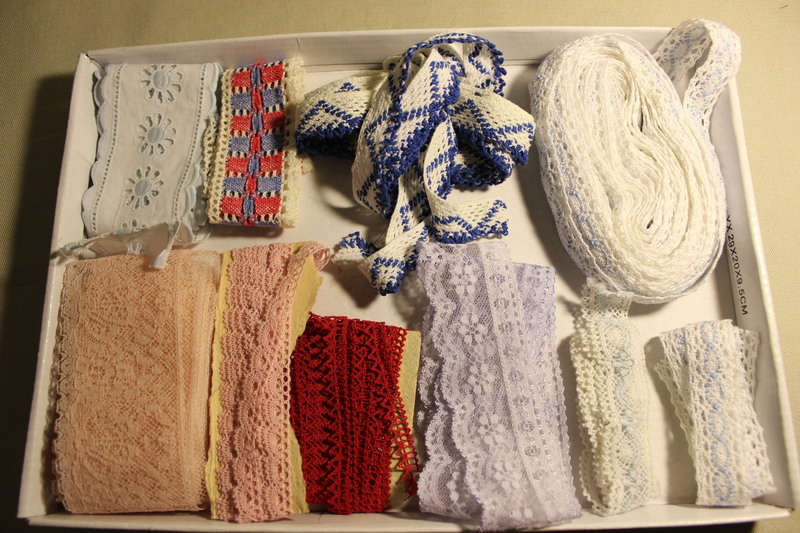 The package containd a shoe box full of all sorts of different pieces of lace. Ok, so far so good. 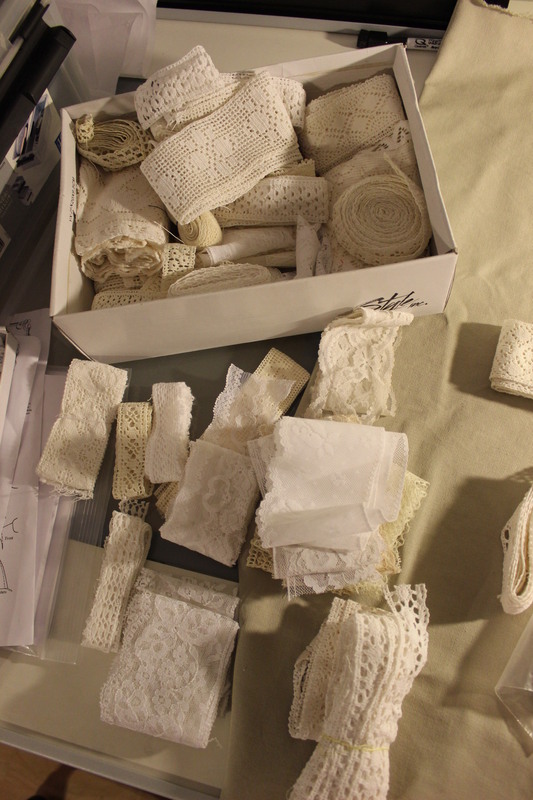 The auction had called for a box with about 50 asorted lace pieces of different lenghts. 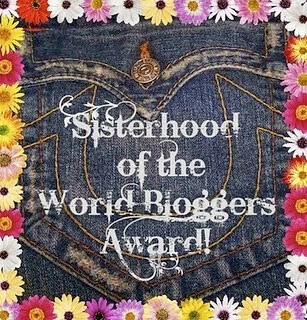 But when I started going through it, I found lots of pieces I didn’t expected. There was atleast 7 (!) 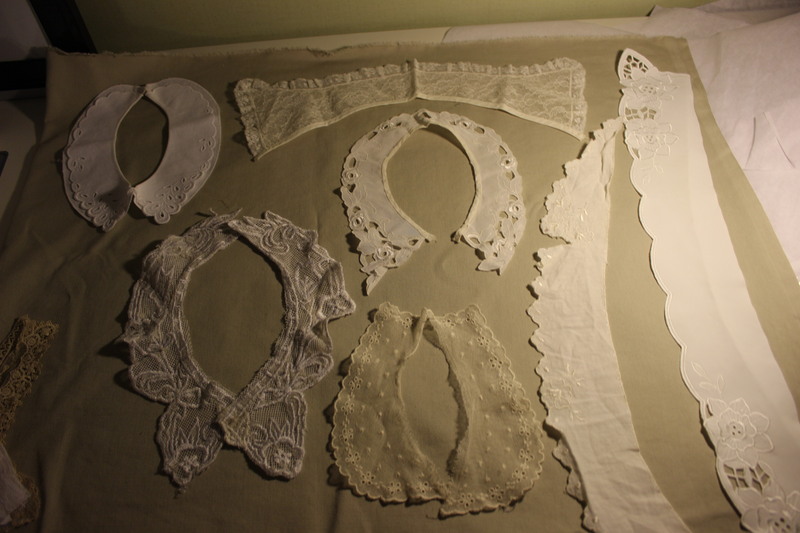 lace collars of different shapes and sizes. 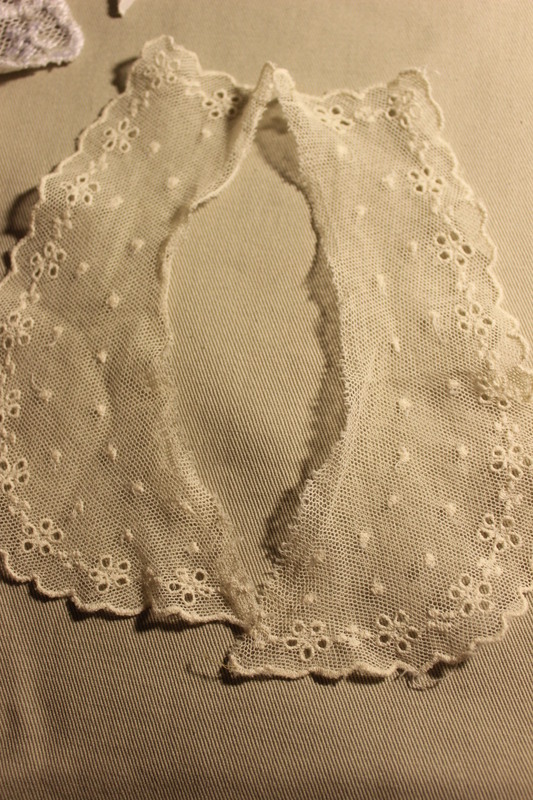 I mean, look at this awesome little collar – probably prevousley attatched to a little girls dress. 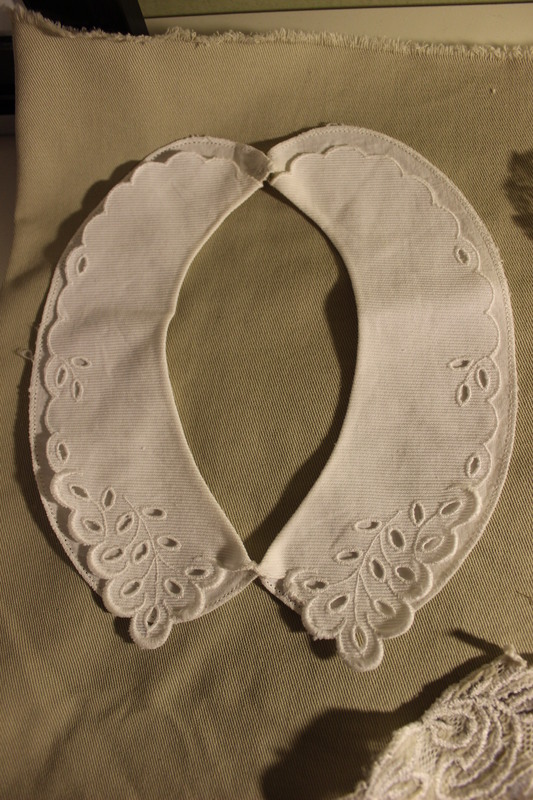 And this “peter-pan” collar with its double layers. And this one is just darling. I also found these two pieces – which I’m not sure what they are for. 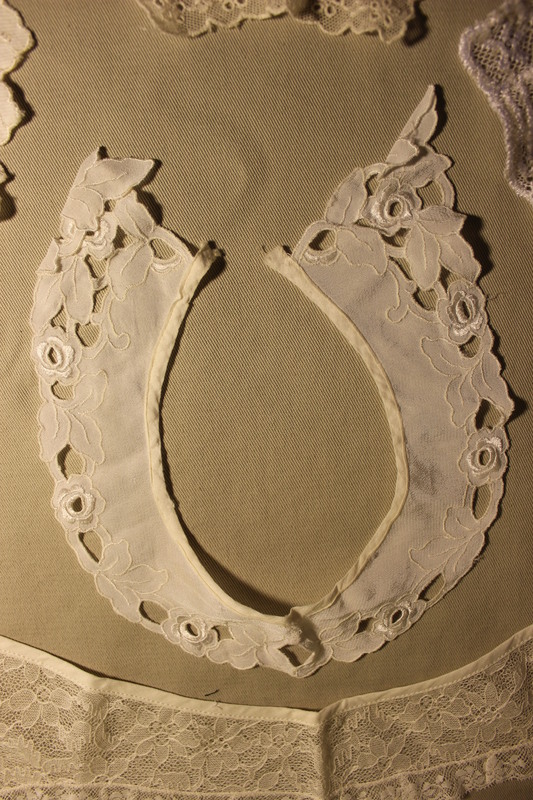 But I’m guessing the big one is a collar or fichu of some kind, it’s about 70cm long. And the little one could be a sleeve cuff (sadly I only found one in the box). What do you think? Could it be a single cuff, It is the right size, or is it something else. And don’t you just love the end of the bigger piece. 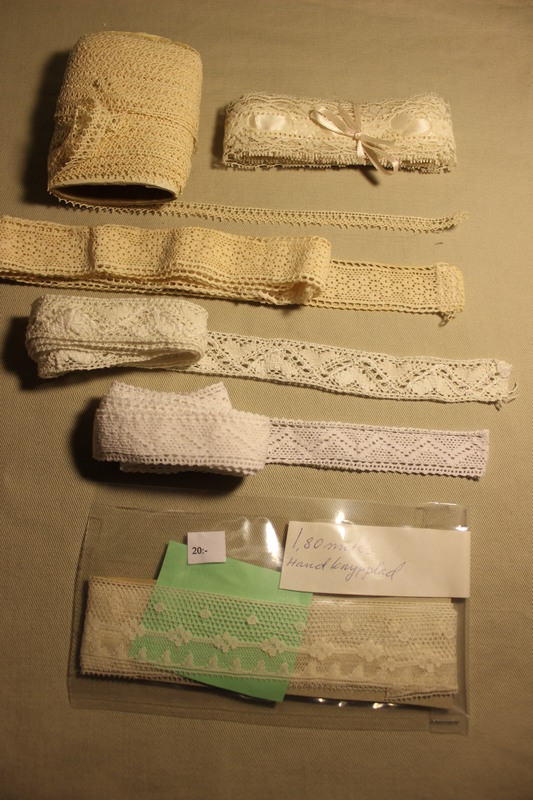 And then of course there was some regular lace in the box as well. Here are a few of the wide widths. 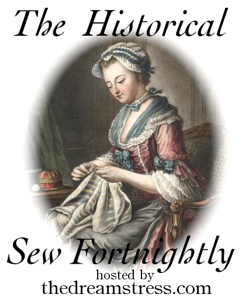 And some of the one of lesser widths. 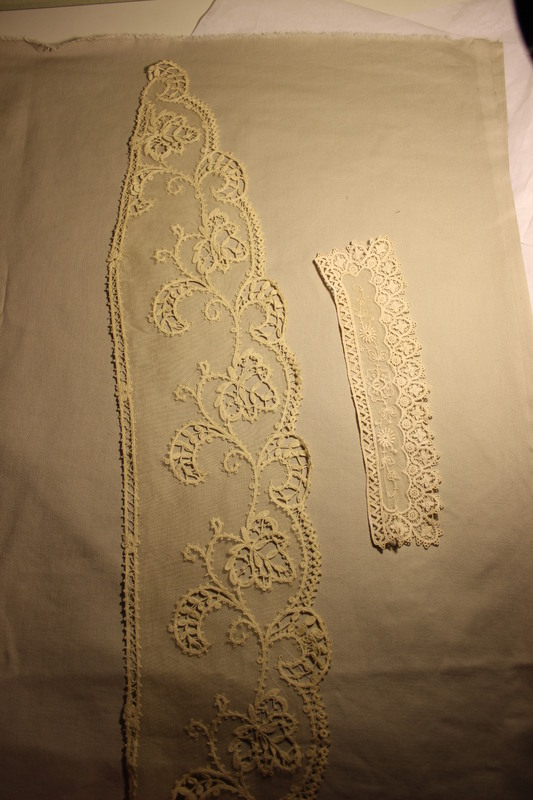 The top one is starched, and feel almost like papper. 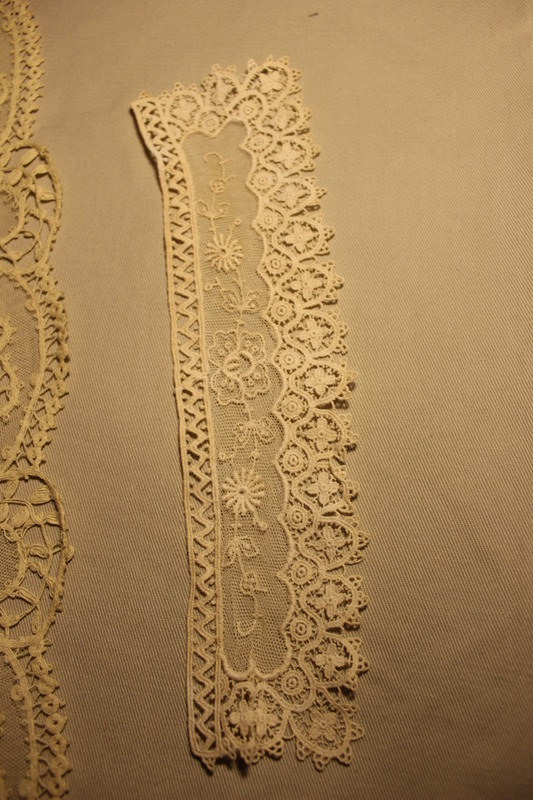 And the one on the bottom says “1,5 m hand made lace” and “20 sek” (2Usd). 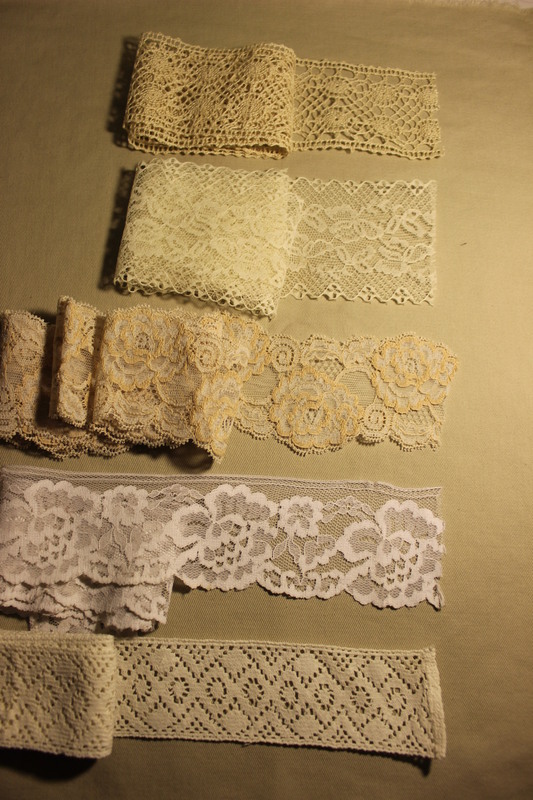 And what would a lace collection be without some colored speciments. 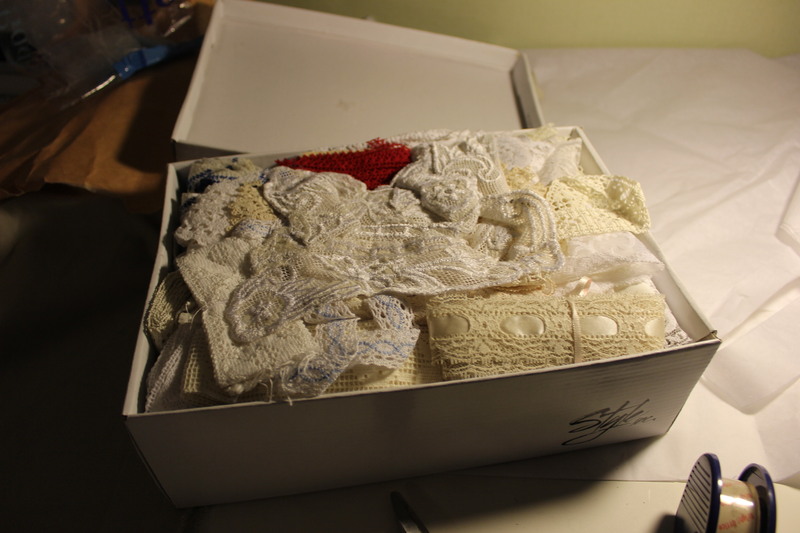 And since this box of magic seems to have belonged to a great horder/seamstress the wonders don’t stop there. 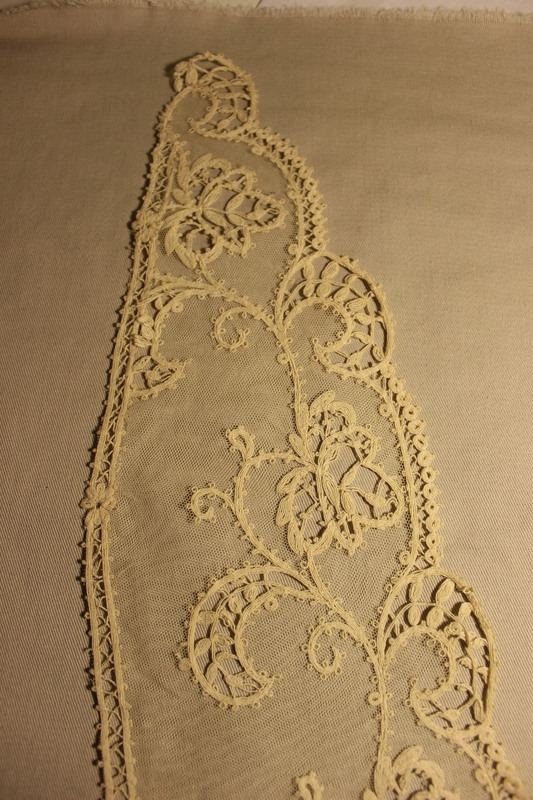 I guess I will decorate lots of my costuming pieces with lace this spring. What I payed for all this magic? – 45Sek (5Usd).